In 2012 I traveled to Kigali, Rwanda, to visit a friend living there on a Fulbright scholarship. This was the farthest I’d been from home, either culturally or as the crow flies (definitely as the Qatar Airways flight with an overnight layover in Doha flies). Rwanda may be the most curious place I’ve visited, with the possible exception of the San Luis Valley in Colorado (more about this place on another day). Culturally and economically, it’s a long way from its East African neighbors, which I’d never visited before either. Even before colonialism and the horrific politics that culminated in the 1994 genocide, Rwanda’s reputation in the region was that of a strange and reclusive kingdom in the hills. I had just over a week to get a sense of the place and its insistently stoic and private people. Which may be to say, once you’ve run your eyes over these few paragraphs and pictures, you’ll know the country nearly as well as I do. In the interest of protecting people’s privacy, I’m not going to share details about the locals I met, many of whom were close friends and colleagues of my host. We spent most of our time in Kigali, the locus of Rwanda’s stunning rise from post-genocide devastation toward 21st century cosmopolitanism. It’s the seat of President Paul Kagame, whose small army ended the genocide, and whose charisma, aggressive economic policies, and heavy hand have shaped almost every aspect of life across the nation, from restricted speech on ethnic identities to official English policies in schools to the near absence of litter and crime everywhere. Whether he’s a hero or demagogue is the topic of lively (and sometimes deadly) debate, which usually takes place behind closed doors, with the shades pulled and the internet disconnected. 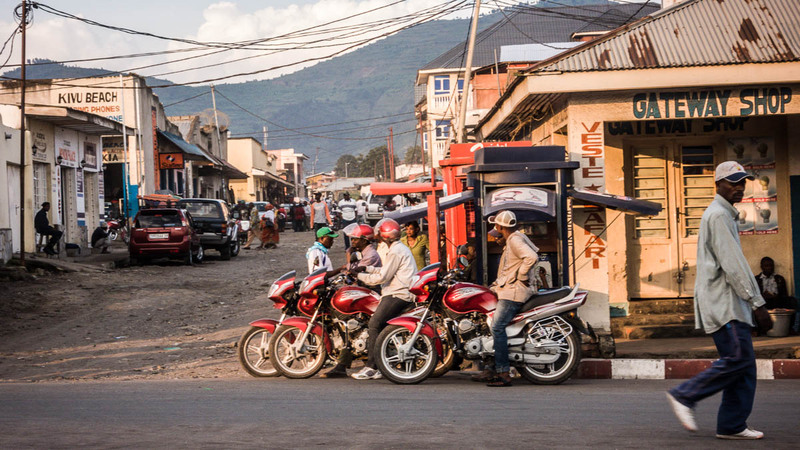 My friend and I drove across the country to spend a weekend in Goma, the capital of the North Kivu province of the Democratic Republic of the Congo. Goma lies right on the Congo/Rwanda border, accross from its sister city, Gisenyi. To walk from Gisenyi to Goma, past soldiers and border agents and other low-level actors in the performance of authority and security, is to step from the rapidly developing world to the rapidly disintigrating one. Or maybe more accurately, the perpetually disintegrating one. While Rwanda’s rise is recent, Congo’s decline has been a historical constant, the variables being who’s ostensibly in chage, who’s rebelling, which Western corporations or oligarchs are profiting, and where in the cycle of calm and storm lies your particular point on the map. Goma, in October, 2012, was at peak-calm, with the last guerilla insurrection six weeks in the rearview mirror, and the next one (I’d later learn) about four weeks ahead. During such spells of non-violence, wealthier Rwandans, along with Western NGO workers and diplomats and academics, often make the pilgrimage to Goma. For the nightlife. 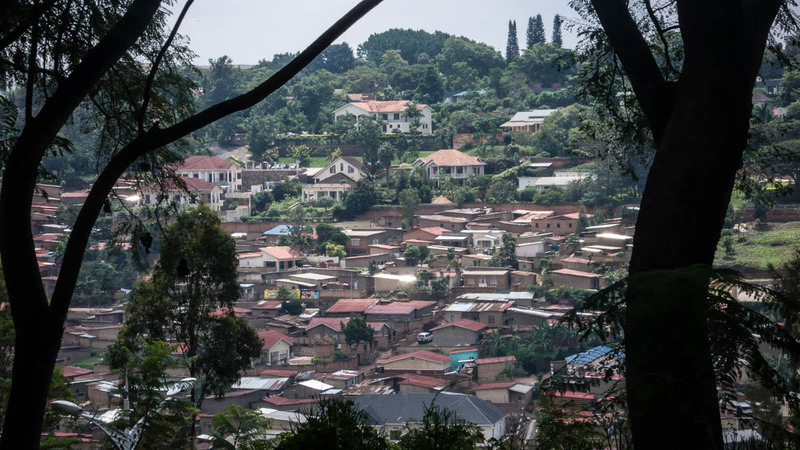 On paper, Rwanda shames Congo—Rwanda has international stature and a rising middle class, is practically free from corruption, and no one there poaches gorillas or gets killed by militants or volcanos. But no one loves the food there either, and unlike people on the rest of the continent, no one seems excited by the local music. Meanwhile, in Goma, they know how to party. Even the soldiers at Goma’s United Nations MONUSCO peacekeeping base, who will welcome you past their razorwire and phalanx of armored personnel carriers to their monthly open-houses (as long as you don’t look too African) can get down. They have their own brass band, and whatever they lack in peacekeeping acumen, they make up for on the dance floor. You should have seen those grizzled mercenaries shake their asses. I stayed with friends of friends of my friend at the local compound of Handicap International, a French NGO that takes care of people who have been almost but not quite killed by global conflict. Several times I found myself bouncing over the lava flows on Goma’s main drag in the back of H.I.’s Land Cruiser Troop Carrier, elbow-to-elbow with lovely French and Belgian ladies in cocktail dresses. We hopped from Kivu Club to Big Club to Coco Jambo, spending American Dollars on Congolese beers, dancing to music from all over West Africa and Europe and the Americas. I have now been to more dance clubs in Goma than I’ve been to in the United States—which isn’t saying much, but still … we were in Congo for one weekend. Some local trivia: Mt. Nyiragongo, an active volcano that never stops belching smoke into Goma’s already smoky sky, threatens the people as ominously as the guerilla forces do. Black veins of hardened lava branch along Goma’s streets, wearing out suspensions, reminding everyone of the 2002 eruption that left 120,000 homeless. Goma is the home of the Chukudu, a wooden scooter with hubs made from old truck bearings, that locals ride over the unpaved roads, sometimes with nearly a thousand pounds of produce or other cargo (don’t ask me how this works). Goma and Gisenyi sit on the gorgeous shore of Lake Kivu, which would likely be an even more desireable resort destination if it didn’t periodically explode.